Last years animation blockbuster has finally danced its way onto DVD, HD-DVD and Blue-Ray that is based on the days and lives of the Emperor Penguin in Antarctica. Interestingly enough, the movie is based on real-world of events of the lives of the Emperor penguins and the rigid conditions they face in this dangerous winter wonderland. With that said, before watching the movie and to appreciate the effort the creators have put into this movie, it would be a good idea to watch the March of the Penguins which is a documentary on these fascinating creatures. However for the sake of the story, Happy Feet revolves around Mumble, a young penguin who is born into the great nation of the Emperor Penguins. Unfortunately for Mumble (voiced by the talented Elijah Wood), he cannot sing and as all good penguins know, each penguin must have a singing voice in order for their mate to find them through the winter storms. Fortunately for Mumble, he has learned how to tap dance that is frowned upon by the council of the penguin empire. Mumble's mother Norma Jean (Nicole Kidman) believes that her sons dancing is cute, however Memphis, Mumble's father (played by Hugh Jackman) favours the council and believes that this is a sacrilegious. Although Mumble is different than the other Penguins, he soon befriends Gloria (Britney Murphy) who happens to be the best singer in the empire and when Mumble tries to incporpoate his dancing into the world of singing, he is made an outcast by elder Noal (Hugo Weaving) who banishes Mumble from their empire. Mumble's journey soon starts to unfold as he befriends a group of fairy penguins called the Adelie Amigos with their leader Ramon (Robin Williams) who embark upon an adventure and eventually learns his place within the world of man and animals. 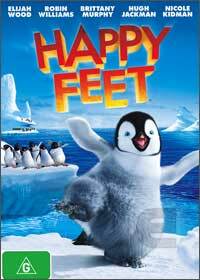 In conclusion Happy Feet is a great movie that is wonderfully directed, however the movie unfortunately looses its plot near the end of the film with no explanations given but fortunately stumbles onto an entertaining endings. Definitely a movie for the kids and also those wanting a movie without all the Hollywood violence and adult innuendos.